An unprecedented, behind-the-scenes look at the career of famed former Los Angeles Dodgers General Manager (a position also known as “The Big Chair”), whose tenure spanned nine of the most exciting and turbulent years in the franchise’s history. During his tenure with the Dodgers, Colletti had the highest winning percentage of any general manager in the National League. In The Big Chair, he lets readers in on the real GM experience from his unique vantage point—sharing the inner workings of three of the top franchises in the sport, revealing the out-of-the-headlines machinations behind the trades, the hires and the deals; how the money really works; how the decision-making really works; how much power the players really have and why—the real brass tacks of some of the most pivotal decisions made in baseball history that led to great success along with heartbreak and failure on the field. Baseball fans will come for the grit and insight, stay for the heart, and pass it on for the wisdom. Ned Colletti began his MLB career with his beloved hometown team, the Chicago Cubs, more than 35 years ago. He worked in Chicago for a dozen years and was in the front office when the Cubs won the National League East in 1984 and 1989, after which he moved on as director of baseball operations for the SF Giants. By 1996, he became the Assistant GM for the Giants, before being hired as the GM in Los Angeles in 2006. There he oversaw the Dodgers through the highly publicized and acrimonious divorce battle between Frank and Jamie McCourt that culminated in the equally highly publicized sale of the team. He was present at the press conference where Don Mattingly, having just watched his team eliminated from the playoffs, used the post-season conference to vehemently discuss his lack of a contract extension. He brought marquee names like Greg Maddux and Clayton Kershaw to LA, as well as marquee drama with the likes of Manny Ramirez and Yasiel Puig; hired future Hall of Famer Joe Torre as manager; and oversaw fourteen Dodgers playoff wins. And these are just a few of the highlights. 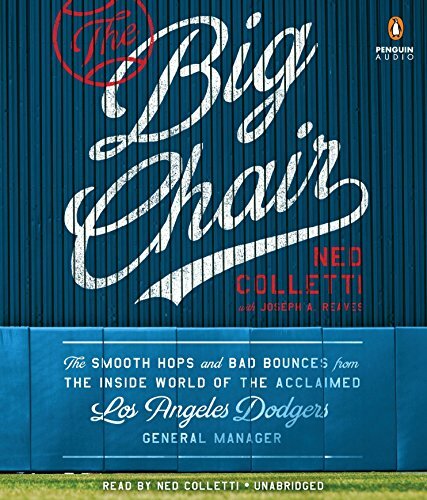 Colletti serves up a huge dish of first-hand experiences with some of the biggest names in baseball history (Barry Bonds, Greg Maddux, Don Mattingly, Don Zimmer, Tommy Lasorda, Scott Boras, Vin Scully, and more). From his humble early years living in a Chicago garage to his path to one of the most prestigious positions in professional sports, his very public and illustrious career has left a permanent handprint in the history of America's sport—and now he's ready to share the insight only those who have sat in The Big Chair have ever seen.